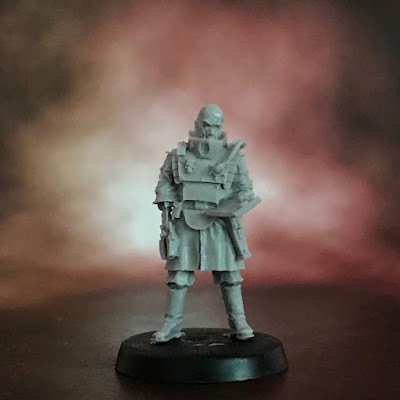 I thought I'd gather my developing thoughts and pict-captures on my Legio here. I'd love to hear your thoughts. Tincture: Terracotta and turquoise; representing the fertile land and open skies of Sumer. Charge: Hand with Coronet – the coronet surmounting the hand on officers; and grasped in triumph on Titans, to represent the joining of man and machine. Edited by Apologist, 15 January 2019 - 07:49 PM. 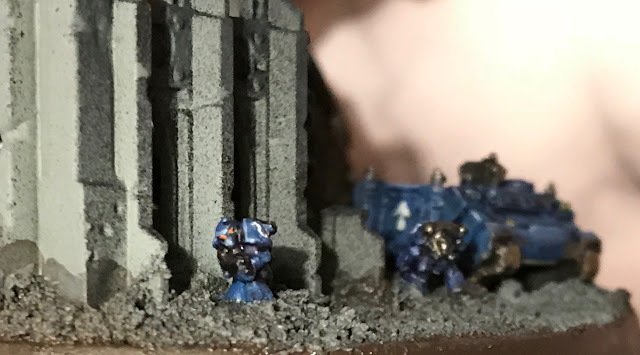 It was fun to add some Ultramarines; though whether they're scattering in front of the Titan, or desperately trying to take it down is unclear. 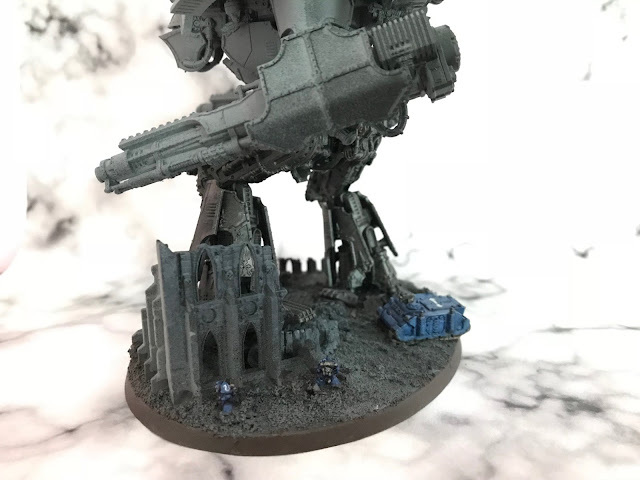 The infantry are from the 1st edition Adeptus Titanicus; you used to get one or two with each Titan blister. The Rhino's a later Epic: Armageddon-era one. Edited by Apologist, 29 August 2018 - 08:36 AM. I'm assuming/guessing Fidelitas Scindere either means "halved loyalty" or "loyalty to those who seceded"? Either way, fantastic start. Fidelity to secess, -ere is an infinitive. Yeah, I'm just following Forge World's lead on this – it's the in-universe terminology they use. I don't think High Gothic is necessarily accurate Latin; it's just a gloss to give a sense of age. Thanks for the kind words on the base, and feel free to steal away! Thank you; and yes – I'm using it to mean 'split loyalty'. Basically, they're rebels loyal to the Warmaster, but unreliable ones. 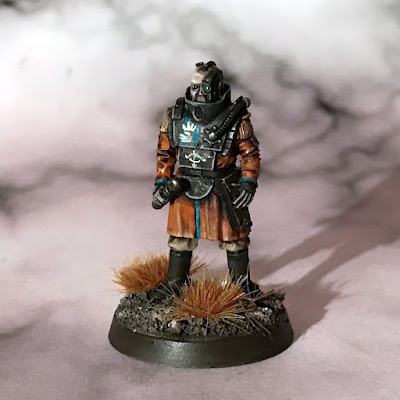 Divergent from the Mechanicum and with tense relations to the greater Imperium from Compliance (owing to their star-scrying and various other 'odd behaviours'), the discontented Forgeworld of Sumer was an obvious choice for the Warmaster to court. 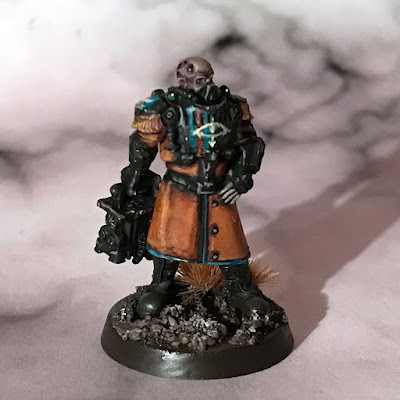 The bulk of the Legion followed the broader Forgeworld into rebellion. However, their peculiar practice of following star-sign and portents, and their semi-independent status meant that some maniples refused to enter battle in support of the Warmaster's forces; or withdrew at inopportune moments. 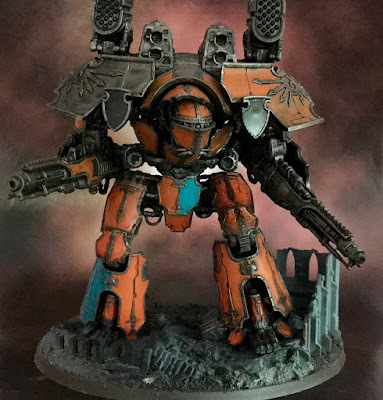 Rather than becoming officially Traitoris, the Legio Nikator was thus declared Scindere. Edited by Apologist, 29 August 2018 - 09:47 AM. Another quality thread from you, sir. Looking forward to what comes. The hall echoed to the sounds of industry. Restless turbines roared, sirens rang out intermittently, and the ring of hammer on metal – a steady, mechanically perfect beat – was, quite literally, deafening. Stummers built into her augmetics kept her ears from being damaged, but she could feel the rolling, endless noise as physical pressure. Rolling her shoulders, she continued her walk down the Via Diluvian; the great arched corridor into which the Titan hangars opened. Ignatzya looked about her as she walked, trying to keep her pace measured and dignified. Quite aside from the noise, the hall was overwhelming. Colossal pistons paced inexorably up and down; brightly-turned-out serfitores and overseers scuttled about, delivering, repairing or retrieving armaplas elements and piping; and great banners, many tens of yards long, moved reverently in the heat that arose from the minor forges. As the great piston nearest her reached its nadir, a slam of air pressure made her torso shake, even as the group was swallowed up in the mist it released. The cloud flashed with the oranges and reds and neon greens of the industrious hall, and Ignatzya breathed in the acrid-sweet flavour of burnt zinc and oil. It carried her back to the Arvus that had carried her – years before – from the orbital to the Field of Portonus, where she would be harnessed and trained. As the door had opened, her blood had been up. She remembered being half-turned, in a crouch that was part wariness, part readiness to fight. As the air had equalised between the shuttle and the new planet, she had been enveloped in a similar swathe of mist, similarly lit from without by mysterious coloured flashes. As that cloud had cleared she had taken her first breath of the air of Slav Nasr. 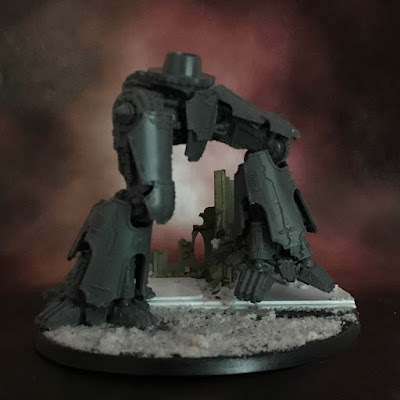 Titan-forge. Not the world of her birth; but then, the qualifications to become a Godrider necessitated a net thrown wide – system-wide. As they marched out of the dissipating mist, she saw a rank of perhaps two dozen Princeps and Moderati a hundred yards or so in front of her group. The senior crew's backs were to the advancing helots, and they were swathed in their own cloud – this bleeding from the great censers swaying from the augment-Magi. The figures were ranged in front of a God-machine's head, which was underlit by stablights, suspended on colossal chains above the altar. Ignatzya's chest tightened and her pulse began to race as Princeps Berossus turned to watch her and the others close. She clenched her teeth to dismiss any nervousness, her hands closing into fists. She would be part of the crew of a Titan. Godrider. World killer. Nice stuff. Just wondering where the Princep holding the scepter with both hands is from? I know the one with a hand on pocket and a hand on scepter is an Event one and also a Reaver Princep. And I know the one with the bag is from an Alternate Warlord Titan Head. Good eyes on all. The central model is the one that comes with the Mars-Alpha head (i.e. the basic head). The flashes of fluff and first-person view that you weave into your projects are as terrific and enjoyable as ever. A thread to follow, for sure. Second to none. There's nothing more to say. The left knee and thigh (right of the image) are furthest along. 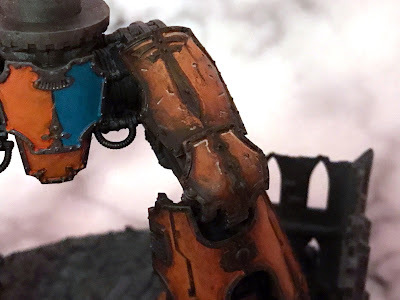 As I mention on Death of a Rubricist, I've probably gone a bit overboard on the weathering/damage here, but that's what experimentation is about. I can always return to refine this area later – but equally I may find that this detail works better in the context of the whole titan than in isolation. I'm thoroughly enjoying building and painting this kit – it's an absolutely cracker. A genuine triumph of miniature design, and a real pleasure to work with. There was a GME box sitting on the shelf of my local indie shop... I had to try very hard not to get it until someone popped by and picked it up. I experienced a mix of relief and regret like never before, and definitely blame you, Apologist. 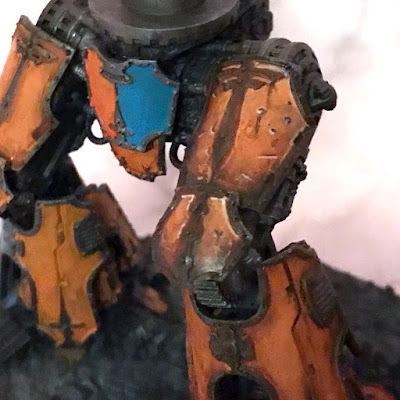 Back to the Coropedion, the mix of teal and orange looked a bit off at first but I think it needs 1) time to sink in and 2) weathering. Anyway, eager to see more! Concur with the captain on the color palette feeling a bit off to me... the more I look at it though I can visualize the Star scrying group enjoying the color of the mottled sky and the fury of the suns emblazoning the universe. 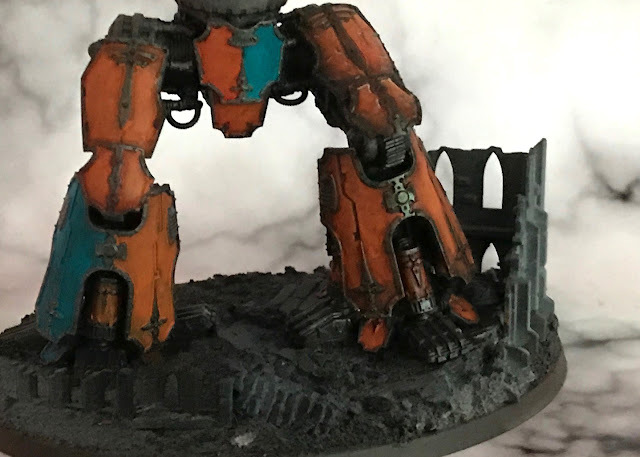 I like the heavy hand with the weathering on the thigh plates... feels very real to me as the god machine punching through the buildings at its feet and the variety of impacts against it from the numerous arms being launched at it. Thanks both. I agree the colours look a bit odd at the moment, but I’m going to persevere. What we’re seeing here are the brightest parts; the shading will go a long way to muting both down to terracotta and turquoise, rather than orange and teal. That was what I was thinking when thinking about/seeing your colour choices. Can't wait to see the end result! A close-in brawler, Megasthenes Dura has a reputation as a dangerous Titan to inhabit. Its current Princeps, Sigue Ilaster, bears a crude bionic as mute testament to the truth of this. 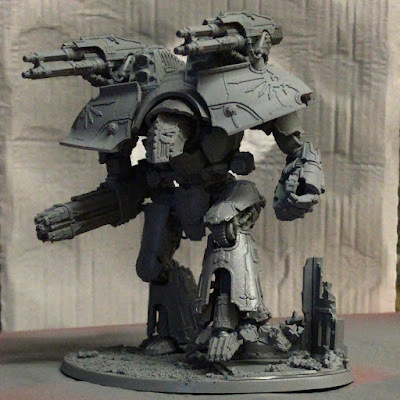 Principal God-Engine of the Maniple, this flexibly-outfitted Reaver is amongst the oldest of the Legio. 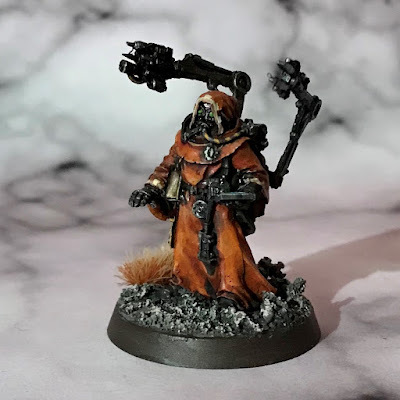 I love the idea of painting/modelling the crew as well as the god engine itself. 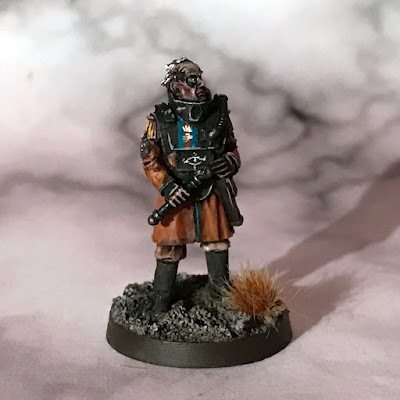 When the warhounds (finally) get released I shall have to give it thought myself (I know, its not that long, given the timescale on Necromunda, etc, but I'm mostly interested in the little guys). Edited by Achinadav, 10 September 2018 - 02:05 PM. 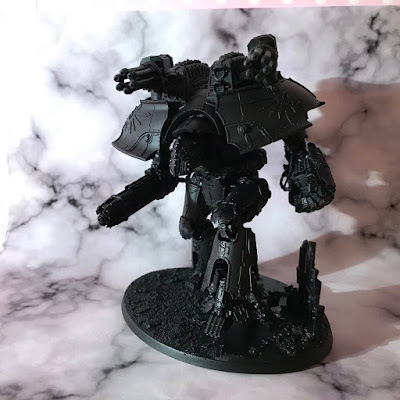 Oddly loving the paired weapons on the Reavers, I must refrain from buying one until payday argh! The main conversion here was to cut into the toes and reposition them, to look like it was striding through low rubble. 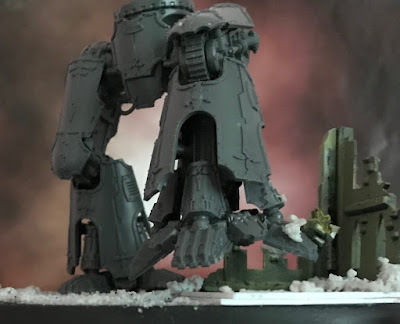 I posed the ruins and added some spare rubble to the raised foot to look like the Titan was in the process of kicking through. Brutal. The conversion work is well done. 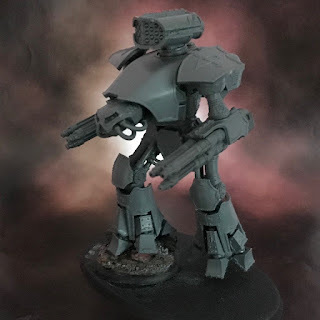 Fully-painted Titan any time soon? Here’s hoping. I’m doing some work on my house, so hobby time is a little stretched. I haven't been around here for some time and it seems I missed on some amazing projects... Apologist, this is great work great sense of size and weight of those God-Machines - and an unusual pattern too! 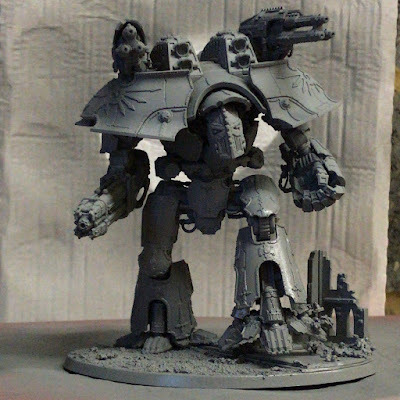 So let me get this straight: You have Megasthenes Dura, Senex Codommanus and Ipsus Granicus build and ready for painting. 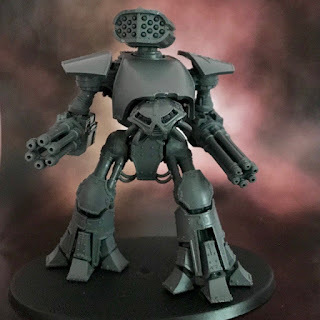 So maybe it's high time to join Titans of the Heresy - the first Adeptus Titanicus specific event! Brilliant, love the foot repose - subtle but so effective. 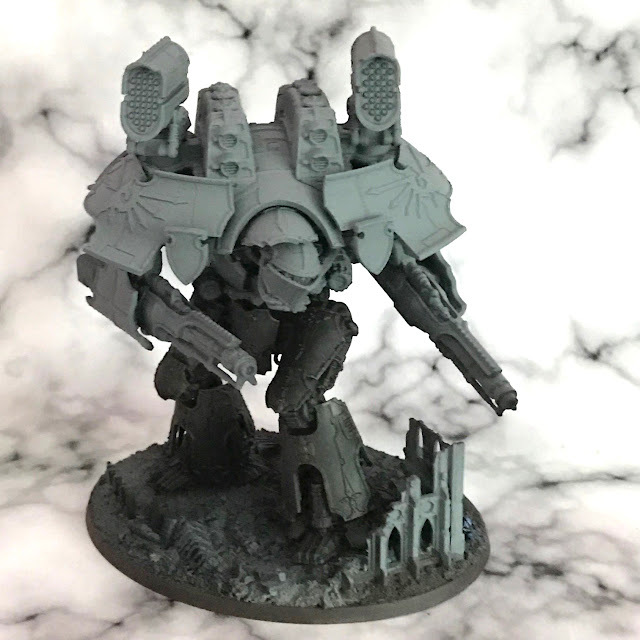 Adeptus Titanicus tips and tricks!